Back in 2006 James Glickenhaus and Pininfarina gave us the one-off P4/5 by Pininfarina, a rebodied Ferrari Enzo. Shortly after the first images were released, I loaded one of the photos in Photoshop and made an impression of how a 'Competizione' version could look. I used this opportunity to pay homage to Luigi Chinetti's legendary North American Racing Team (N.A.R.T.) 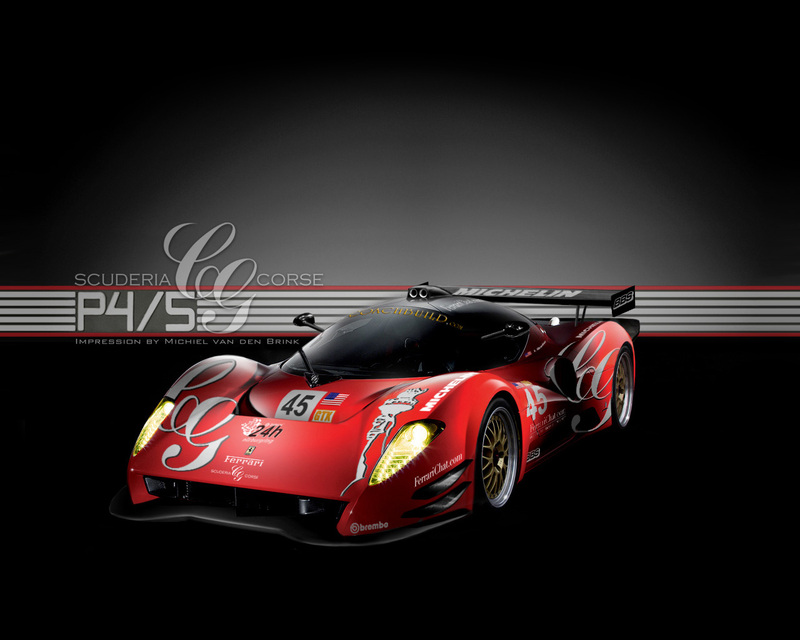 and for the enjoyment of James (Jim) Glickenhaus and the many P4/5 Tifosi, I posted the digital rendering on FerrariChat.com. Good ideas never come alone, as it now appears, because when Jim manages to find a major sponsor, this car is actually going to become reality! "There are a LOT of stars that would have to align for this to happen but it's not impossible," Jim stated. P4/5 was first shown to the public at the 2006 Paris Auto Salon and that was where I spoke with Jim and Pininfarina's head of Special Projects, Paolo Garella, and it seemed they were playing with the exact same idea. 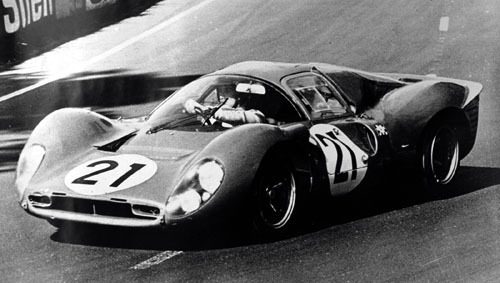 It just felt as the right thing to do, because P4/5 was inspired by a legendary and highly succesfull competition Ferrari: the 330 P4 with bodywork by Piero Drogo. P4/5 really belongs to the racing circuits. At FerrariChat.com Jim has always spoken freely and with much passion about the creation process of P4/5 and daily life with his very own one-off, and some time ago he came up with this dream of having a P4/5 Competizione built. So I added another impression to the thread, again with N.A.R.T. livery and now pictured from the side to show the more stretched rear end. According to Jim, this effort would be like something NART would have done in the day, but the car will not race under NART-banner, because Luigi Chinetti is not involved. At FerrariChat, Jim said: "The NART rendering was done by Michiel on his own a while ago and was simply his fanciful idea as to how the car could look long before I seriously began investigating the possibility of building it. She will of course not be Scuderia Ferrari but will run as part of our Scuderia Cameron-Glickenhaus." Ferrari is not involved in this privateer's project, but since the chassis, the VIN and engine say Ferrari, the car will be added to the race's entry lists as being a Ferrari Special with a Ferrari engine. Jim does not mind about the official F-badge, he already got the prancing horse on P4/5 'Stradale'. About the Pininfarina badge, there will probably be none, but Jim can do whatever he likes with the design, because he owns all the rights. If you search 'Ferrari P4/5' on the web you'll notice that this car has taken on a life of its own and so did the yet-to-be P4/5 Competizione. Jalopnik.com had been eavesdropping FerrariChat and published Jim's plans along with my NART-impressions, which soon found their way to numerous weblogs and even onto TopGear's website. This is a good thing, because Jim still needs a big sponsor. Jim: "You put the idea out there and you see if it interests people." "Our hope would be simply to put on a good show, enjoy ourselves and let the winds of the old days blow through our hair. The 2010 24 hours of Nürburgring is where this adventure may begin. In addition we could do other races and when her racing days are over she'd go to a lot of events. There'd be a lot of exposure and it's not going to cost Crazy money. This venture isn't to make money. It's simply to enjoy ourselves and get some good exposure for a Sponsor who'd like to ride along. The Adventure has begun and for me the road is often more interesting than the destination." Now that's the spirit, Jim! Make us Tifosi happy! Sign in at Ferrarichat.com to stay updated of this wonderful venture. Click here for the P4/5 gallery and click on the image below for a 1280x1024 wallpaper. 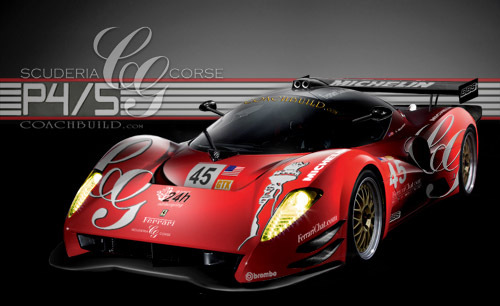 Sources: Ferrarichat.com & James Glickenhaus. Impressions by Michiel van den Brink.